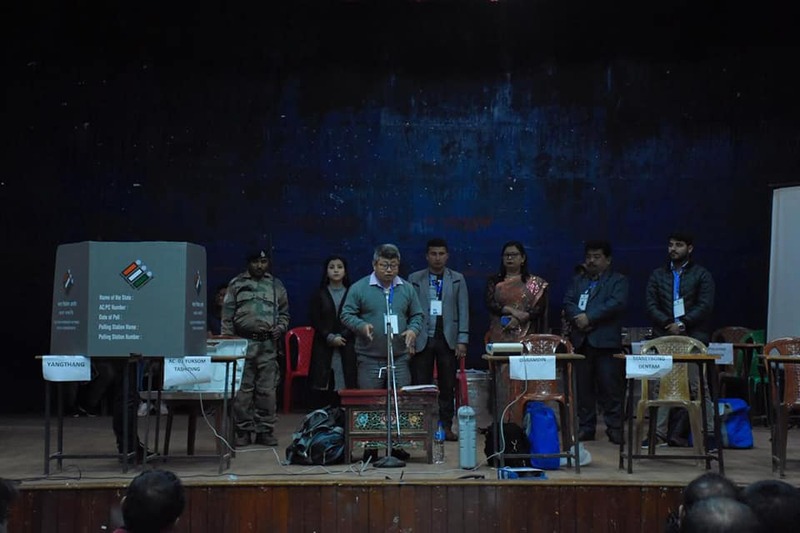 Gyalshing, 08 Apr (IPR): Four-daylong final round training which started from 5th April, 2019 for Presiding and Polling Officers of West District for the forthcoming election 2019 concluded on 8th April, 2019 at the Community Hall, Gyalshing, West Sikkim. The training has the presence of District Election Officer (DEO) West, Shri. Karma R. Bonpo along with Mr. Karma L. Lepcha, ADC (W) and the Master trainer, Mrs. K.C.S Tongden Lepcha. Addressing the gathering, DEO, Mr. Bonpo emphasised on forming the respective polling teams today itself and understand the task at hand and to perform their assignment as per the guidelines and leave no room for any errors. He suggested officers present to take consultations for any clarification or confusion. He informed that, the mock poll of Electronic Voting Machine (EVM) and Voter Verifiable Paper Audit Trail (VVPAT) is mandatory at the Polling Station before starting the general voting in presence of the polling agents of the political parties. He gave stress on filling up the “FORM 17 A” “FORM 17C” and PRESIDING OFFICER’s DIARY strictly. He also made clear to them about the duty of Presiding and Polling Officers after the poll is over. Master trainer, Mrs. Tongden, gave directions on general duties of the presiding and polling officers, wherein she explained in detail about the role and responsibilities of the officers for conducting the election successfully. Hands on training on Electronic Voting Machine (EVM) and VVPAT and its technical aspects were attended by all the present participants. The Polling materials and commissioned EVMs and VVPATs to Polling Parties will be distributed from 8 am onward on the 10th April, 2019 at the Auditorium Hall, Girls Senior Secondary School, Kyongsa, Gyalshing, West Sikkim. However, the strong room will be opened at 7 am on 10th April, 2019 in the presence of representatives of Political Parties.